SLCG Blog: Did UBS Charge its Proprietary Puerto Rico Bond Funds Excessive Markups? Did UBS Charge its Proprietary Puerto Rico Bond Funds Excessive Markups? UBS Puerto Rico's closed-end funds have received much attention in recent months. While the coverage has focused on the funds' leverage and concentration in Puerto Rican municipal bonds (see for example, New York Times and Bloomberg), discovery and further research into the funds is likely to reveal other important issues -excessive markups, for instance. Investors, including mutual funds like the UBS Puerto Rico Funds, buy municipal bonds from dealers who typically charge a markup over the price that the dealers pay for the bonds. A trade history for each municipal bond is available through the Municipal Securities Rulemaking Board's Electronic Municipal Market Access system. Comparing the markup (often computed as the difference between the purchase price and the inter-dealer price on the same day) with the distribution of markups for similarly-sized trades, we can determine whether the markup on a particular bond trade is unusually large and therefore likely excessive. SLCG has a research paper measuring excess markups on municipal bonds (PDF).1 In this post, we illustrate how to apply the methodology developed in the SLCG paper to the bonds in the UBS Puerto Rico Funds. The table below shows the trading activity from September 27, 2011 to November 10, 2011 in a $51.55 million face value, 6% coupon Puerto Rican municipal bond (CUSIP 74527EFA1) issued in July 2011. Using monthly data on portfolio holdings for US mutual funds we know that the Oppenheimer Rochester VA municipal fund (ORVAX) had purchased $1,645,000 of this bond in October 2011. On October 14, 2011 we see a customer purchase of the same par amount as the amount held in the ORVAX fund. Starting from the bottom of the table and working our way up, on September 27 there was a $3 million customer sale and a $3 million customer purchase. These trades were likely through the same broker, since there are no contemporaneous large inter-dealer trades. The spread between the customer purchase and the customer sale is $0.281 and the half-spread is $0.1405. On the afternoon of October 13, there is a customer sale of $2,895,000. On the following day, there are two large customer buys of $1,000,000 and $1,645,000, both at a price of $105.401. Since there are no inter-dealer trades, these trades are likely to be with the same dealer. The spread between the customer purchase and the customer sales is $0.404, and the half-spread is $0.202. It is likely that the dealer who bought the $2,895,000 in the afternoon of October 13, 2011 at a price of $104.997 sold the remaining $250,000 to another dealer at $105.603 who, in turn, marked up the price to $107.603 on October 14, 2011. The brokerage industry received a transfer of $2.606 per $100 in par value traded for this small trade. Although we are in the process of analyzing individual portfolio holdings for the UBS Puerto Rico funds over the last 6 years, it is harder to track the UBS Puerto Rico bond purchases because the Puerto Rico funds do not report quarterly holdings, as do the mainland funds. Also, the mainland funds reports once filed with the SEC are eternally available while UBS only makes publicly available the most recent version of its Puerto Rican mutual fund reports. However, we have spotted some patterns in the trading data that make us question whether the UBS Puerto Rico funds paid excessive markups for the bonds in their portfolios. On March 31, 2010, the UBS Puerto Rico Fixed Income Fund IV held $250,000 in par amount of a bond issued in May 2008 by the Government of Puerto Rico's Employees Retirement System (CUSIP: 29216MBA7). A year later, the fund held $7,750,000 in par amount of the same bond so we know that the UBS fund made net purchases of that bond totaling $7,500,000 par amount during that year. The table below has all of the trades occurring on September 23, 2010 for the Retirement System bond. All of the trades on that day occur within an hour of each other. There are six inter-dealer trades, all occurring at the same price of $99.25. There are five customer purchases, all occurring at the same price of $100.5 and seven customer sales, all at a price of $99. All the customer purchases occurred at the same price of $100.5, despite wide variations in the trade amounts. The $1.25 markup results in a $27,500 transfer from the customer purchasing the $2,200,000 in par amount to the brokerage firm selling the bonds. In our municipal bond paper, we analyzed over 13.6 million customer trades, totaling $2.5 trillion in par amount traded to calculate the fair markup for any given trade size. For trades of $2,200,000, the median markup is about $0.038 per $100 in par amount, according to our analysis. Therefore, the customer purchasing the $2,200,000 paid $26,647 in excessive markups. In contrast, two trading days later on September 27, large trades were executed at low markups for the same Retirement System bond. The table below shows a customer purchase of $10,000,000 for a price of $99.25 and nine customer sales totaling $10,000,000 for $99. The spread on these trades is $0.25 and the half-spread is $0.125. 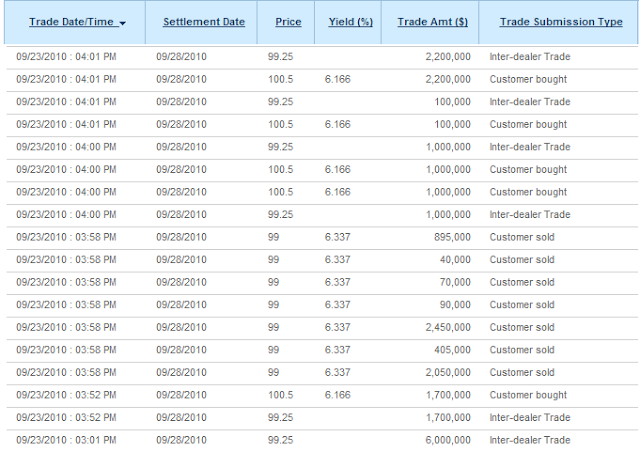 It appears that customers selling this bond on September 27 paid the same markdown as the customer selling on September 23. On the other hand, the customer buying a large quantity on September 27 effectively paid no markup (consistent with the evidence in the published literature on such large trades) while the customers buying large quantities on September 23 appears to have paid excessive markups. UBS’s bond funds should pay miniscule markups consistent with large purchases by institutional investors but by virtue of its common control of the bond underwriter, the bond deal and the portfolio manager, UBS might have paid much higher markups since the benefit of such high markups flow to UBS and the costs are almost entirely born by fund investors. Detailed transaction data analysis should be done on all of the purchases of bonds in the UBS Puerto Rico funds, allowing us to determine whether UBS was paying itself higher markups than those it received on the same bonds from mainland funds and whether UBS paid higher markups on UBS-underwritten bonds than on non-UBS-underwritten bonds. Although we currently do not have access to such detailed transaction data, we are in the process of analyzing portfolio holdings using the 114 (and growing) annual reports and mid-year holding reports from 2008 to 2013 that are currently available to us. Stay tuned for our analysis which we will post in the coming weeks. 2. Breen, Hollifield, and Schurhoff (2006) "Dealer Intermediation and Price Behavior in the Aftermarket for New Bond Issues."